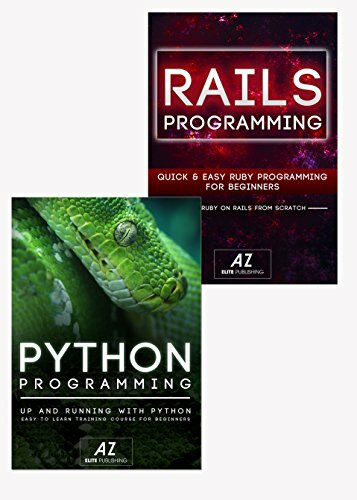 Rails and Python BoxSet: Quick and Easy Guide to Rails Programming + Python Programming For Absolute Beginners, In 110 pages or less! Python: Learn Python Programming From Scratch, in 81 Pages or Less! The goal of this box set is to ease the way for new programmers to be able to get up and running with a program without having to go through 100s of pages of advanced and hard to read material. Using this you will know how to get started, follow a few simple examples and test your skills using the resources provided. Ruby is a relatively easy language to pick up. You will need a walk-through that helps you set up Ruby initially if you aren’t an experienced programmer, but you’ll be able to start building your first program immediately. Becoming a Ruby expert will take longer, of course. Depending on how many hours a day you’re prepared to put into becoming a Ruby master, you can become good enough to work on your own projects in a matter of months. It’s usually more a matter of a year or two to learn enough about Ruby development to be able to land a job with your coding skills, provided you’re starting from absolute zero as a programmer.